The media is giving mixed messages lately. 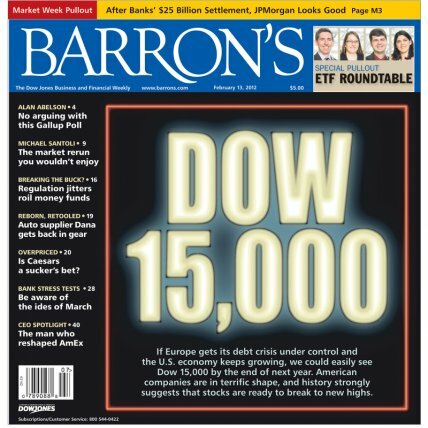 On one hand, we have Barron's weekend cover story, predicting Dow 15,000. 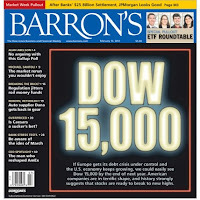 This suggests the bullish sentiment is getting more over-blown, and it's amazing how many times covers like this have marked intermediate market tops throughout history. In this particular case, though, Dow 15,000 isn't really that far away, considering the Industrials closed at 12,801 on Friday. So maybe the cover isn't that big a deal. And on the other hand, we have the mainstream media acting like Friday's close of a whopping 10 points lower (for the S&P 500 (SPX)) was the beginning of the end, and that we'd all be better off investing in Pokemon cards. Actually, come to think of it, that's not a bad idea. My daughter already has a huge collection, so I've got an insider edge; plus I wouldn't have to worry about Bernanke trying to queer the Pokemon market. Anyway, the media spent a lot of time harping on the fact that Friday was the worst day the market's had all year, etc.. So, it's hard to draw any kind of solid conclusions from this stuff: is the media overly bullish or overly bearish? And besides, it's not like we're going to base our trading decisions on the headlines. Anyway, the fact that the media jumped all over this little decline like it was the end of the world should be troubling to bears. Really, the way sentiment works in general is a bit hilarious. On Friday, suddenly Greece was an issue again -- even though it's been a problem that we've known about for at least a couple of years. But Friday, it was a problem again. It's a problem, then it's not, then it is, then it's not again -- seemingly forever. This is why we don't trade on news -- and I believe news is noise. Media fluff not withstanding, the challenge I was facing on Thursday hasn't really changed. The indicators have all reached extreme levels that have been concurrent with market tops in the past -- but the wave counts still lead me to believe the market has a little more upside left in it yet. However, the wave counts aren't necessarily pointing to a lot of upside -- in fact, Friday's decline pulled the low end of the SPX target zone down to 1358, which is only a few points above the prior high. So, whether the exact top is in or not, the preponderance of evidence suggests a top of some kind is very close. Let's review some of the indicators, as well as some new evidence, and then look at the wave counts. 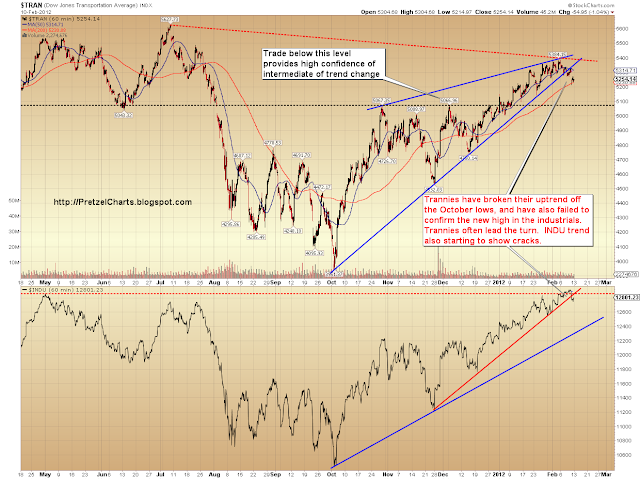 The first piece of new evidence that the rally might be running out of steam is the Dow Transportation Average (TRAN). The Trannies have now broken the up-sloping trend line from the October lows, and have also formed a negative divergence with the Dow Jones Industrials (INDU). 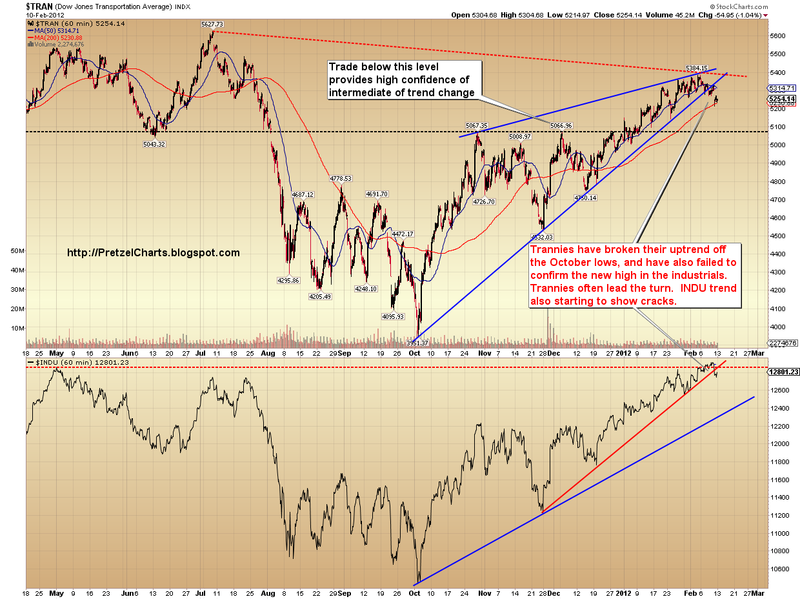 The Industrials made a new high, while the Trannies didn't. Under Dow Theory, the two averages must confirm each other -- if they don't, it suggests a trend change is coming. The last non-confirmation was in July 2011, but it was reversed (Trannies made a new high, INDU didn't). Chart below. 1) The Nasdaq total volume ratio has reached extreme levels. 2) That Nasdaq article also contains my weekly top study, which suggests a top in sight. 3) The Bullish Percent Index hit historic highs at the beginning of the month. 4) My proprietary top and bottom indicator fired a sell signal on Wednesday. And of course, there are other problems for the market, such as the 4 unfilled gaps well beneath current prices, and the persistent overly-bullish sentiment. So, those are the arguments in favor of the rally ending soon. The question, of course, is whether it has ended already, or has a little more upside left -- or whether it will continue to blow through these indicators after a brief pause. I think it's unlikely that the rally can keep stretching everything to further extremes without at least a modest correction first. The shape of that decline should give us some clues as to whether that decline will turn into a rout, or if it will just be a correction with more rally to come. In any case, we're getting ahead of ourselves. It continues to bother me that bears are as excited as they are, since it seems almost too easy. Of course, this is coming on the back of a brutal rally, but still -- top picking usually isn't so obvious that everyone and their mother can do it. So onto the wave counts, which suggest to me that there's a little more upside left in this thing -- probably not much, mind you, but maybe enough to add some confusion to the picture here. The first chart is the SPX 10-minute, which is starting to get a bit cluttered. Quite frankly, you have only yourselves to blame for the clutter. I already know this stuff, so it's not like I spend all night cluttering up these charts to avoid helping out with the dishes. Anyway, the alternate count in black goes with the idea that wave 5 is over and some sort of top is in -- but the preferred count believes there's still a little more upside left. It's a pretty tough call. As I mentioned, Friday's move pulled down the projection for wave 5, so the minimum target would be 1358. The maximum target could also exceed the 1365 level -- depending on the structure of any forthcoming rally, it could point that projection higher. If the alternate count is correct, then the first target on the downside is 1300-1310. Trade above the recent highs would rule out the alternate count; trade beneath 1321 would rule out the preferred count. Next is the SPX 5-minute chart. 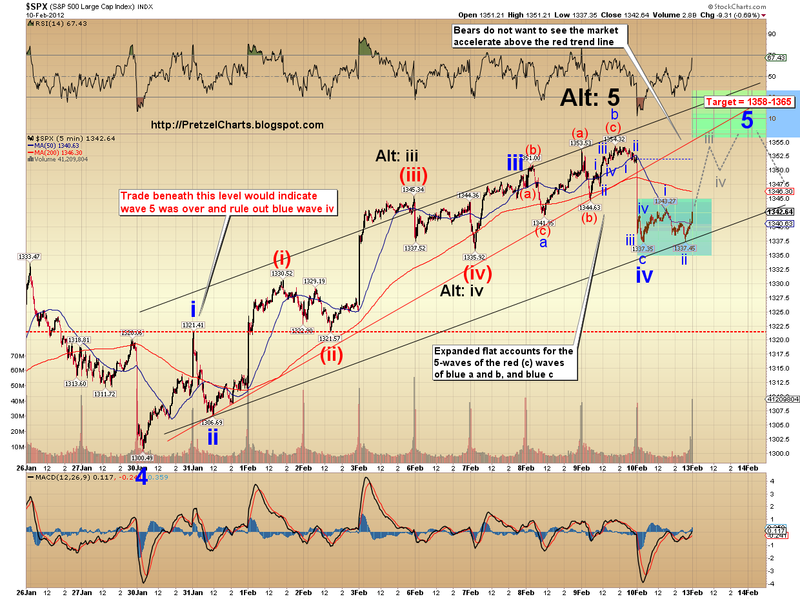 Friday's market traded right into the wave iv target box and began reversing. This chart shows the count in a bit more detail. The final chart is the Dow Jones Industrials (INDU). This count is slightly different than the SPX, and I want to share this chart to illustrate the fact that, assuming the count is correct, fourth waves can be tricky and no one can really predict whether the market will head straight up to wave 5 or meander sideways first. I've annotated the sideways possibility in gray. In conclusion, despite the bear euphoria -- in fact, partially because of the bear euphoria -- I suspect there may be at least one last surprise left in this rally. My first target is 1358-1365, however that could stretch higher depending on the form taken by any rally. In either case, the preponderance of evidence strongly suggests a top of some kind may be very close at hand -- and if the wave count is right, it should be sooner rather than later. However, once again, until the trendlines are broken, the rally should continue to be given the benefit of the doubt . Trade safe. Hi all. Haven't posted in a while as most of the posts are way out of my league.Does anyone have thoughts on the idea that, based on the Dow/gold ratio, we may have already seen the decline we're waiting for if you consider the market priced in gold (that cannot be manipulated monetarily)?Based on the chart, the 50 DMA crossed the 200 DMA, and it is headed toward resistance. If it breaks, could this be the start of something new? Just wondering. I guess you need to post a chart that compares Dow/gold to Dow. The first standalone is hard to evaluate. AAPL is a reflection of the current market. market, sundry technical analysis confirming the trend notwithstanding. was a one thousand fold increase. At its low, AAPL was selling for $7. corporate world is now dumping their BlackBerries like hot potatoes. great honest and objective article PL! Loved reading it. Tomorrow will be very interesting. Gap up? Side ways? Bulls wanna push it above 1351, to keep going. Bears wanna push it down 1337 to have more sellers coming in. Anything between that (1338-1350) is just sideways action IMHO. Staying in channel is my prediction. Could be up, down, side, but in channel. go hit the beach PL. a little sun n mango juice does wonders. eat some plate lunch n empanadas mayby. I'm heading to Kauai tomorrow and plan on some, lol. In 1995, Microsoft released Windows 95, selling a record-setting 7 million copies in the first five weeks. Arguably, by 1995, at $10, MSFT was a crowded trade. But it did peak at $50 1999-2000. Sorry, I left right after my first post. Here they are side by side. I don't know how to superimpose the two. That would be better. Basically, based on the price of gold, the Dow rally that began in 2009 was a Fed fabricated one. Priced in gold, the Dow continued to decline until late Aug 2011. I agree totally mavrich...long Yi-gi-oh. News just in: Greek parliament passes austerity bill. Rally on Monday. This could be the final push to complete the 5th as PL suggested. Gap up and fade it down. It's as though you are reading my mind. Thanks - great update. Greek Parliament approved EU imposed austerity measures. lol, 8 "good post" -- and 6 total trolls, pizza likers, and drug addicts who've lost their crayons. Nobody wants me to say it looks like the waves are still headed up, or what? It's the same thing I said on Friday! all the other kids with the pumped up kicks better run . . . . Thank you, based on your great work. looking to get back in long again. hello katzo = quiet tonight = people watching grammys? I've always liked that song, but never watched the video, since I boycotted MTV years ago when "The Real World" came out -- I *live* in the real world; I don't need to watch it on TV. Especially on a "music" television station. Anyway, that video makes me feel really old. I assume they wrote the song to try and raise money for their class trip -- what are they, like seventeeen? One of these days if you guys really twist my arm, I might consider posting a couple of my songs, just fer fun. Haven't recorded anything new in a long time, though. you played music??? neat, love to hear some. ty Arnie. My best guess is that wave 4 is complete and we run higher next session or three. Obviously, the market will provide early hints if that's correct or not. And I agree w/ DD below, I think we'll either stay in the channel or form a new one (as depicted on the Dow chart. Just a quick learning experience to other new futures traders like myself, know ALL trading platforms in advance. I learned the hard way Friday and luckily it didn't cost me anything but profits. I was traveling and trading on my Ipad as opposed to my home system, well the platforms are night and day different. The Ipad requires your pasword to be entered every 15 minutes and their are certain quick trade modules missing. I found this out trying to exit my longs and had a total meltdown. The market saved me by rallying but it could have been ugly. A +10 became a +2 TF. Alright, why not. This one's about 10 years old (it says 2004, but that's just when I uploaded it). This is one of my solo efforts. I used to work with a co-writer sometimes, who played a mean piano (my best friend), but he died quite unexpectedly in 2010. Haven't had the muse much since. Since we're on the subject; I actually used to do a few stock-market related satire-type songs from time to time too. I'm also a musician, and have a real appreciation for patterns and the like. I just have a hell of a time applying them. Which is why I play the banjo... let the Hee Haw jokes begin! Not for nothing but is there any law that says you absolutely have to trade when you're traveling? My God. What can't you do. What talent!!!!!!!!!!!!! Awesome!!!!!!!! Love it!!!!!!!!!! I've always considered myself to be something of a weirdo, because I'm quite heavily logical/mathematic (left-brained) as well, and my IQ is into the range where attempts at measuring are considered inaccurate (well *below* 55, lol). But often the artistic and logical traits seem to manifest in people as mutually exclusive -- hence the engineer types who have no clue how to relate to other humans; or the artistic types who have no clue how to file their taxes or balance their checkbooks. I think that's one of the reasons I've always been drawn to Elliott Wave Theory -- as you suggested, it requires something of a balance between the two modes of thinking. I'm actually sitting here demo'ing OEC Trader, wondering if I dare try it with real money. The trade from chart feature has burned me twice now. I keep trying to set stop or limit entries and it puts me in at market. Think it may have something to do with cursor settings... Luckily all I'm blowing is funny money, but it's the principle of the thing. Took a small short at ES 1347.50 -- trying for a quick counter-trend play (or more depending on what develops). Keeping stops pretty tight, since I think the next degree trend is still up. 1) After the "all Greek problems now resolved" was sounded before Thursday's market open, the market (S&P) only rose by 0.125% for the day. 2) On Friday, the "solution" was called into question, but it has now been "solved" again? Who is left to buy on this news after Thursday's "Greece solved" euphoria? 3) Market breadth readings peaked on February 3rd and have been heading down since. On Thursday's market top, breadth weakened more noticeably, and on Friday there was a big drop. 4) The financials and corporate credit performed poorly on Thursday, even as the market made a new high. 5) Expectations for this week's Empire Manufacturing Index (due Wed. 2/15) and Philly FED Index (due Thurs. 2/16) appear overly bullish. A disappointment could sting. 6) This week is monthly options expiration. With the relentless rise in prices that has taken place over the past two months, market makers and large option writing institutions have a great incentive to bring the market down ahead of OpEx. A sharp down move in the market would leave an enormous amount of call options "high and dry". 7) The performance of VIX, VXX, VXZ, and TVIX over the past 3 trading days. On Wed. and Thurs. they all rose slowly even as the market kept making higher highs. On Friday, they exploded higher when the S&P lost less than 1% for the day. This implies that the bulls are jittery. They are pretending to be calm as they whistle while walking slowly toward the exits. However, based on the VIX, there is already a small crowd assembled near the exits. Right now, I think the bulls are far more eager to protect and keep the gains already made than they are eager to push for higher highs. The combination of profit taking here, and large option writing institution's incentive to drive the market lower into OpEx should lead to more downside for this week. Ha! Me too. Mine's funny money though. Can I ask what you use for a trading platform? Don't try to make sense of cartoons. OptionsXpress. I'm sure there's better stuff out there by now, but once you've used something for longer than a decade, it's hard to feel any need to switch. If it ain't broke, why fix it and all that. Besides, sometimes more complicated doesn't mean it's better. Anyway, didn't I e-mail you a referral link? I thought I did, but maybe not. Their referral deal is if someone signs up through the e-mailed link, then we both get $100 in our accounts. Why not, it's free money for us. If anyone else is interested, let me know and I'll email you a link. ES is backtesting the underside of the broken trendline -- this is the bulls first test tonight to show if they're serious or not. You did. And I appreciated that very much. But you're right, they're definitely not the cheapest and I'm looking to scale into this with the lowest possible front end costs. Oddly enough though, the company that's currently at the top of my short list is actually a wholly owned subsidiary of Options Xpress. They were purchased in 2008, which coincidentally seems to be about the same time that Ameritrade bought the company that published the software platform that Options Xpress used to use for futures trading. OEC had this kinda groovy little software platform you see... do you recall any software upgrades around that time. Just professional curiosity. I know there have been upgrades along the way, but I don't recall time frames as to when or what, honestly. I have to get some rest now but I thought you'd like to know that the spreadbet markets here in the UK have shot up to 1350.6 in th SPX thus supporting your view there is more to come upsides. I wouldn't get too carried away though as they don't obey EW rules- being leveraged products -and are frequently completely wrong! We shall see, but it is a nod in your direction. Also I have found a trend which you may find interesting which could support your WV3 interest. Mon am: Nasdaq100 has squeaked a new high (2570) and SPX has reached its former high, russ2000 and INDU are lagging and they don't look as if they have the legs for new highs. FTSE and DAX look likely to reach new highs but not by much. So: Its all to play for. In my post PL for this current wv5 structure (as I think), its a standard motive wave which is 5 waves in the direction of trend. Wv4 is allowed therefore to overlap wv1 but not go below the origin of 2. Amongst other restrictions. It isn't an impulse wave which is a form of motive which has the restriction you mention that 4 cannot overlap 1. Still, it ain't over 'til its over so- as usual- we won't be able to call the final count until it is confirmed, say today or tomorrow? I enjoyed reading the thoughtful post by Authentic1, rising vol confirms a wave 5, on which topic the wave 3 folks perhaps still need to say why the volume has been so low and dropping lower each day lately and not booming ahead at double or treble this volume. They may well be right of course, nothing is certain except death and taxes! In my post PL for this current wv5 structure (as I think), its a standard motive wave which is 5 waves in the direction of trend.Wv4 is allowed therefore to overlap wv1 but not go below the origin of 2. Amongst other restrictions.It isn't an impulse wave which is a form of motive which has the restriction you mention that 4 cannot overlap 1. ES has completed a 5-wave move up. Bears should hope that's it and not wave 1 of 5. If it's 1 of 5, my earlier target of 1378 is back in play for sure. Anyway, I've never been a huge believer in the Dow/gold ratio as a means of charting the Dow. It's an interesting indicator for various other reasons, but I don't think it's relevant to reality. That's a goldbug thing, "Oh, it's the Dow priced in real money." But I don't agree with that philosophy. While I agree that gold has more value than paper, that's only because people are willing to *pay* more for gold than they are for paper. Generally speaking. The only value gold has is the value that the marketplace assigns to it. It does not have "intrinsic value" to any greater or lesser degree than any other commodity. The only things that have "intrinsic value" are necessities, like food. Gold will never be a necessity, always a luxury; therefore it is not "real" money any more than diamonds are "real" money. PM's are only worth what the next guy will pay for them. Let's imagine it's Lord of the Flies time and we're out in a desert 100 miles from anything. I have 10 cans of Campbell's Chicken Noodle Soup. You have 10 bars of gold. There is no food or water for hundreds of miles and we're on foot. How much "intrinsic value" does your gold have now? Do you think I'd trade my 10 cans of soup for your 10 bars of gold? Not on your life! ZERO instrinsic value. After you're dead, I might try to lug a couple bars along with me, though, just in case I ever reach civilization... lmao. Nah, I like to think I'd be willing to share the soup. Hard to say though, in a life or death situation... It would probably depend on who the other person was and how much I liked 'em. My kids, I'd let them have all the soup. Bernanke, I'd take the gold off his body later on. Anyway, all that to say, while there are some historic comparisons which can be made regarding stocks and gold ratios, I don't think you should read too much into a chart like that. btw, I usually don't bother updating when I'm afk and get stopped, but I got stopped for -1 on this. Hi PL, thanks for your reply, just caught me on the way out. 'subwaves of an impulse are themselves motive, and subwave 3 is always an impulse.' which implies to me that 1 and 5 need not be. Also they say in the prior para that 'wv4 always retraces less than 100% of wv3. So a 99% retrace would take wv4 almost to the start of wv3, which is the end of wv2 thus overlapping wv 1. QED. But I could be wrong, we'll see. I'm happy to learn. Finally, you should be able to find many examples of wv1s where its wave 4 overlaps wv1. what will INDU/SPX do in a few hours I wonder? I'm wondering if INDU fails but SPX makes a new high. INDU decline looks much more impulsive to me than SPX -- plus INDU was already way ahead. Interactive Brokers is good, inexpensive and easy to use (desktop TWS platform). At this point GLD and ES are linked; where gold goes ES will follow. AAPL up to 498 on hugh moring pre-bell pop, said about AAPL ". . . ~ the only bullish game in town at this point, oil, gold, dead, SPX may die too. Do not short IMO." AAPL has a magnet of HIGHER linked to it, anyone shorting this monster do so at their own peril. I agree. Trying to short Apple here is the inverse of catching a falling knife. Honestly, anyone looking to short Apple right now is probably only doing it out of pride to try and be smarter than the market. yep, looks good. My chart reads better with a truncated 5th in the INDU but I was pondering last night if your SPX was going to form a 4th wave triangle. You'd get your thrust up to a new high, the bulls would make a few dollars, the bears would be ecstatic as they know what comes next. See, regarding the 1/4 overlap, I would only label that as an expanding leading diagonal. Otherwise if I see that, it's a 1-2, i-ii (it's not in that case, that's a pretty good LD). FWIW, this has served me well over the years, as it forces the count to reconcile properly and keeps me looking in the right direction over the short term. That's a pretty solid rule for Elliott, that waves 1 and 4 don't cross paths outside of diagonals, so I don't ever cheat that one. Absolutely agree, the David vs. Goliath factor (David with a broken sling shot, lol), thinking one is smarter that the mrkt. Here is a day chart. ES 49 seems to be the first key, below that and we could head down. Break 46 (second key) area would make me feel even better. At 500, APPL is not the biggest market cap in US history, 600 will do that. so its down from here? Did it hit your preferred price ranged overnight? PL excellent work and thanks again. In my brother's industy after you have done something pretty darn well they always ask "gotta nother one in ya? ", lol. Well you deserve an "adjustment" for all your work. Another one of his terms for a bump in pay, lol. a rose by any other name .. etc. Yes, F&P are pretty uncompromising re Motive Waves. Wave 1 always subdivides into an impulse or (rarely ) a diagonal." No wriggle room there: but one can find these sorts of overlap all over the place. However all agree WV3 absolutely has to be an impulse wave so I'm happy to call it a 'wave 1' and move on. Life is too short. "At times, the subdivisions of an extended wave are nearly the same amplitude and duration as the other 4 waves.... difficult to say which wave extended.... usually irrelevant anyway"
If they have a problem, I feel I can have one too! $RUT is looking like my West Virginny cousin's smile...all gappy and ready for some fillings. see...i said to buy the dip on friday. not too late to go long here or add to longs. but hedge with short on GLD. gold/silver headed for a pullback. careful here imo. . . Thanks, I agree. I think 46 will serve as st support here. If it fails, depending on how it does so, I reserve the right to raise my SL and bail early :). got me some ZSL.....thinkin silver goes to 31.75 ? I am with you. Bought 300 TVIX at 16.89 earlier. i sold the 600 TVIX friday that i had accumulated for a week or so.......not reporting price cause im late in this post but suffice to say i didnt sell at fridays high!!! This is what I think. We had an initial throw-over on my 120 ES chart, ED previously posted on this site. Then straight down to break the bottom ED TL, that was normal and completely understood. Last nite we shot up, even gapping up back to a possible double top at 52.75 I mentioned. No double top, a lower high. The gap close is set at 42.25 ES. ES always closes these gaps. Last nite's move was a second throw-over, AND EXTREMELY RARE, never saw this before in my life. A throw-over, then a sharp drop I predicted (the mini-flash crash), then a shooting up with a second throw-over (at 52.25), then now down breaking my key of 46. I can only attribute this second shot up as Fed. positive action working the European desks in an attempt to try and save a continuing damaged mrkt. I also said to watch gold as a clue to direction. I AM VERY BEARISH for the next few days. AAPL broke through 500 and now has temporarily failed it. IMHO, if it cannot solidly regain 500 quickly, this market could sell off very hard. Interesting. As far as gold is concerned, from Friday's intraday low to present low, it is printing a lower low, so it is saying negative divergence compared to ES. Time to sell AAPL. Right at 17 year resistance. Pull back likely. Not trading advice. That was magical and revolutionary. Out of TVIX. AAPL back above 500. Watch it Buster, some of us are missing a few dientes and we're not too happy about it. If I have to reincarnate it had better be into a body with perfect teeth! I think we are giving the powers that be ideas... AAPL back above 500. I get the intermarket relationship between gold and the dollar, and how dollar strength can impact equity indexes. Is there something else in your thinking about the relationship of gold to stocks that is important to know ? Looks like a 5-wave rally off the low -- trade should be good. Stops @ 42.5 now. IMHO, TVIX will retreat back to $14.00 in a week or so, and can go even lower. I also want to accumulate a position in TVIX but I think the Calamity is weeks away, something like 8 weeks, in my mind. But I also think it's smart to start accumulating a bit of TVIX, maybe starting next week, a tiny bit at a time. I peeled off my TVIX throughout the day on Friday and bought more between 16.70 and 17.03 today. Thanks akwfung. I still got all mine but a couple have definitely tried to escape (with a little unsolicited help). Katzo, great call on TVIX 16.6 level. Looks like it bounced right off it. Quite a few are saying it will drop back to 14-15, do you see that this week? SPX hugging that trendline like it's about to head off to war. Should get a nice pop if/when the bulls clear it. Geez, it perfectly filled the gap left from Friday! You ever tried to time them on a days/weeks timescale? $17 is too expensive, but what if you can start buying them at $12 again in a couple of weeks? Averaging down may mean some more at $11 or $10, but the upside, when it happens, should make up for it, no? since oct. gold and dollar have been running parallel. i think dollar and gold will disconnect for a while, an IT call. looking for the dollar to spike very soon, gold and ES down. PL at least one of us, me, would like to know whether you have ever applied your skills to Soybean futures or would consider doing so in a separate blog? TVIX finished retrace, will go up now. . .
i would be very careful on the long side for anything less than short stab day trades, from what I see. I think that the better idea is to average up when VXX, VXY, and TVIX are rising slowly as the market continues higher. That's a sign that a turn is coming that should be profitable for VIX and its derivatives. That's what GGekko did and it worked out well. Otherwise, its continuous bleeding until who knows when. to 21 or 28 price target, then another retrace? A tough one to play, definitely. For example, if you scaled in on Friday, you would be underwater today. Whipsaw heaven. Thanks Katzo, it appears to be doing what you said, the index is moving highere now, but TVIX is holding like a champ. What are some of the important target for TVIX? Just curious, do you follow silver? Do you mind taking a look a its chart? Thanks. Soy proteins are long chain proteins; takes a lot of acid to break down. If you drink it continuously, it's like popping aspirin continuously. Bad for stomach lining. TD Ameritrade. Finally funded it, although this trade was with paper (2 points). Let's see what happens with real money. You're right, for the last month or so, I've been making very small trades (relatively low risk), and they add up...and so do the commissions, but still net up albeit with funny money. I'll make the transition when i'm comfortable with the platform...soon. BTW, I asked their customer service about futures trading in IRA account. They said they'll offer that in a few months. I don't drink a lot of it. But trust me, my stomach does better w/ it than it does w/ real milk. Could turn into a 4th wave triangle here. nice! thanks for the intraday updates pretz. 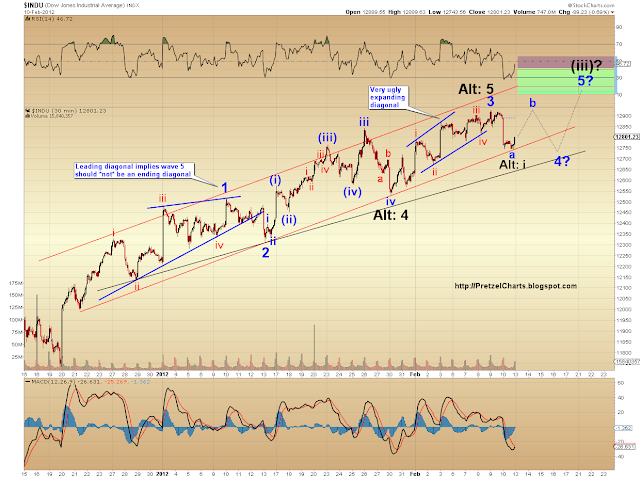 so fourth wave triangle, to fifth wave up to your target zone? 5th of a 5th though... could fall short and basically end up making a double-top. AAPL approaching the lows now! :) Big selloff to follow? Hoping that will be the case, but not counting on it. 50/50 chance. AAPL failed 500. I'm guessing/thinking that we sell off now fairly hard on the markets (either today or tomorrow), unless 500 is retaken quickly. I bought some weekly AAPL lotto-type puts, expecting them to be zeros, but happy with the risk-to-reward. I think it will pull back from here for at least a few days. Then, toward month end and near the unveiling date of the iPad 3, it may go even higher to a FINAL top (for this move). Maybe up to around 520? Then it should correct/consolidate for at least a month. silver (SLV) is a mess, all ABCs, does not tell anything. they're trying to plateau it at the highs so they can gap it up tomorrow. they will gun for es 1368 tomorrow. DD do you know what the money flows are doing today. I believe you are the one that posts that info from time to time. If I am mistaken I apologize. Would be interesting to see if anyone has that info. Maybe what GGekko did was scale in back on 2/8 at $15, then got out at $20. Interesting technique, because it did pop out above the BB before the spike. So, if this is (iv) of v of 5, it'd mean that the most (v) of v can go up to is the length of (iii) which was 6 points +/-...That will put it smack in PL target zone... comments? i think TVIX could hit 14-15 soon. Looking for a good entry point there. Yes. 2/7 and 2/8 were giving off the right signals for a lower risk trade in the VIX and its etfs. sandyone44 also saw this move coming. Today's pattern looks very similar to Thursday's , so far. Nibble at $15.25 is my idea. I would more rather think we're in (v) of v of 5 since the intraday dip seemed to better correlate with the (iv) and pretz said that this rally could continue for a couple days. My guess is we'll hit that target zone tomorrow or the day after and finish (v) of v of 5.
that's actually what I was going to do too. nibble at 15 ish and then add more. It seems like the trend has be 1-3 days in the oversold condition and then it spikes a couple of points. I'm looking at the VIX index as proxy for TVIX. However, my only concern is that TVIX doesn't track VIX all too well. DD do you have any other indicators or thoughts? I have none, except the belief that the "crash" won't happen till April, so buying TVIX too enthusiastically now is playing the sucker. On the other hand, I want to have a tiny position in the "OMG" event overnight if that should happen. So a nibble now at $15-ish is a bad trade, very likely, but it's like buying insurance. Thursday opened with a nine point waterfall move to clear out all the stops set from the previous day's trading . . . immediately and quickly headed up to a new incremental high. Today is a little different. I think buyers just wanted to get into their positions this morning at lower prices and so we had a five point move down and then a slow move back up to retake 1,350. If buyers believe that we'll be visiting 1,360+ soon then it makes sense for today to be a narrow range day and to buy as many shares at these levels as possible, while also getting shorts to cover. I'll be looking closely at the WSJ Money Flow and Selling on Strength numbers after the close. If it looks like the smart money was just hovering up here to sell to all takers, rather than preparing for another move higher, then that would change my thinking. Having now just written that, the money flow today is slightly negative and both the SPY and Apple top the selling on strength chart. Not a good particularly good sign for further advances from here. That being said, with the gap up on the SPY and Apple crossing 500, it's not surprising that many just took the money and ran for the day. We closed today at SPY = 135.33 (cash) on lower volume vs Thursday's close at SPY = 135.36 (cash) on higher volume. Incredible. QQQ made a higher high and higher close on 33% less volume than last Thursday. All credit goes to AAPL. IYF closed at 54.91 vs 54.93 on Thursday on less than 1/3 the volume. Hey Guys and Gals, on travel this week and checked the markets quickly right after close and frikin holy smokes; didn't it just tag PL's suggested iii of IV wave level and possibly also the iv of IV level? I ain't touching at these levels shiiiiit at these levels. I'm a Vix newbie. I doubt there is such a thing as decay on your side unless you want to be the underwriter. As for pricing TVIX, if I draw a Fib retracement from 13.81 to friday's 20.10 (I am using only the close - do not believe in including the tippy toppy spike here), then 15.16 is the 0.786 retracement. A target buy at 15.25 makes some sense - just a nibble though. Inverse H&S developing on $2 range chart... if we break the neckline we could see 1370 soon.